Washington – This week was supposed to be all about health care, but that has taken a back seat to revelations that Donald Trump Jr. sought damaging information about Hillary Clinton from the Russians, especially after the president’s son released a string of explosive emails Monday. Connecticut’s senators joined most Democrats Tuesday in condemning Trump Jr.’s meeting with a Russian attorney with connections to the Moscow government who offered to give him incriminating information about Clinton. Sens. Chris Murphy and Richard Blumenthal. 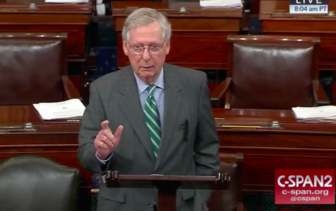 Senate Majority Leader Mitch McConnell and other congressional Republicans deflected questions from reporters about the issue. “The investigation in the Senate is being handled by the Intelligence Committee, and I’m sure they’ll get to the bottom of whatever happened,” McConnell said. Other Republicans downplayed the revelations, or pointed out that Donald Trump Jr. is not the president. “Donald Jr. is very dedicated to his father, but you know he’s not part of the administration,” said Sen. Orrin G. Hatch, R-Utah. The story about Trump Jr.’s meeting with the Russian lawyer was first reported by the New York Times. In an attempt to try to get ahead of a story, the president’s son released a string of emails on Monday “in order to be totally transparent” about the matter. The emails show that on June 3, 2016, one of his father’s former Russian business partners had been contacted by a senior Russian government official and was offering to provide the Trump campaign with damaging information on Clinton.